Who hasn’t used an article of clothing to try and clean a smudged touchscreen or dirty eyewear? Your clothes are for wearing, not for cleaning and it's time to break this habit with the Declan Microfiber cleaning cloths. Fashion meets function with Declan microfiber cleaning cloths. A love for fashion, art, and design has defined Declan as a lifestyle accessory that can’t be lived without. The fun patterns and vibrant colors have turned this functional item into a unique fashion accessory that looks more like a handkerchief or pocket square than a tech accessory. The cloths are the ideal solution for cleaning touchscreens, eyewear, cameras, etc. No cleaners are needed and each cloth is machine washable. 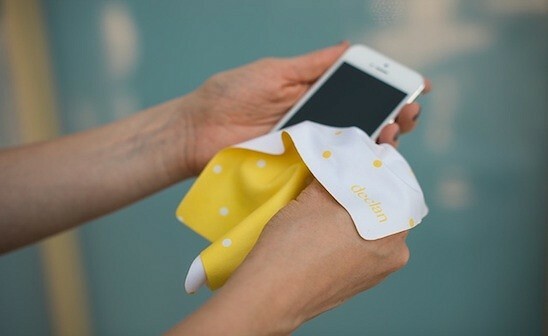 Keep Declan in your pocket or purse for convenient cleaning and say goodbye to fingerprints forever. Who hasn’t used an article of clothing to try and clean a smudged touchscreen or dirty eyewear? Your clothes are for wearing, not for cleaning and it's time to break this habit with the Declan Microfiber cleaning cloths. Fashion meets function with Declan microfiber cleaning cloths. A love for fashion, art, and design has defined Declan as a lifestyle accessory that can’t be lived without. The fun patterns and vibrant colors have turned this functional item into a unique fashion accessory that looks more like a handkerchief or pocket square than a tech accessory. The cloths are the ideal solution for cleaning touchscreens, eyewear, cameras, etc. No cleaners are needed and each cloth is machine washable.